If you came into my studio today you might not notice that something rather special is about to happen. Tucked in the window minding its own business is my very favorite orchid, my Brassolaeliocattleya Greenworth. It has two buds on it. Every day these two buds do their little dance, separating, getting a little wider, looking around the room, twisting towards the sun, preparing to knock your socks off. You might not see exactly how much an orchid moves as it prepares to bloom if you weren’t obsessively checking it daily as I do. 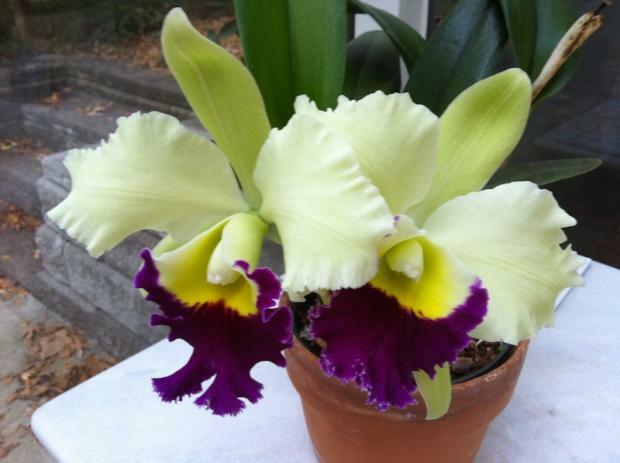 I first acquired my Brassolaeliocattleya Greenworth in October 2011 from the Atlanta Botanical Garden. I’ve rarely spent $30 so wisely. 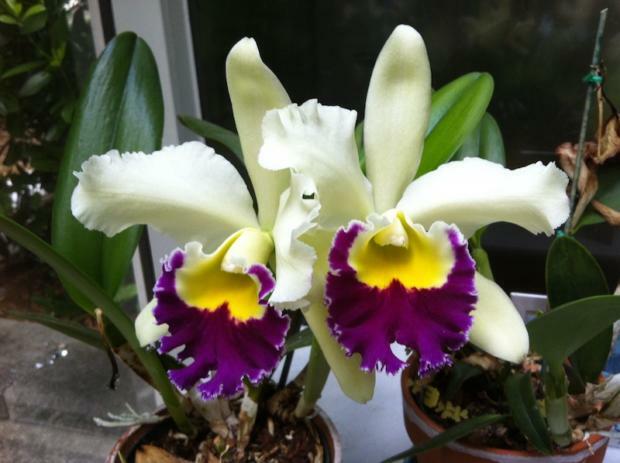 I remember specifically picking out a healthy cattleya that had not yet opened. I didn’t want to know what color it would be. I wanted to enjoy the surprise of watching it unfold. I placed it in a large silver paper shopping bag and carefully protected it in the backseat of my Toyota Prius as I made the 15 minute trip back to my home. Little did I realize that this Brassolaeliocattleya Greenworth would become my favorite orchid of all time, which is really saying something as I have yet to meet an orchid I did not immediately adore. Nor could I have imagined how much I would come to appreciate chartreuse. 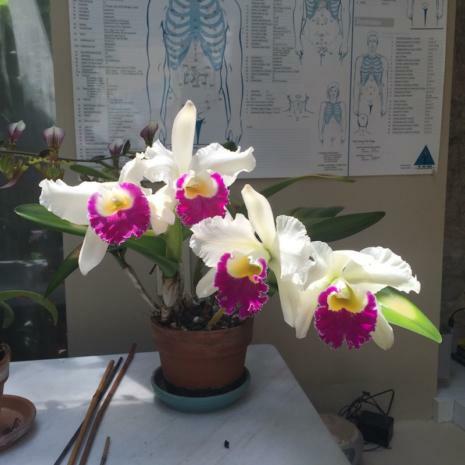 Nor did I realize I had chosen such a fragrant orchid whose perfume would waft throughout my entire studio every time it bloomed. 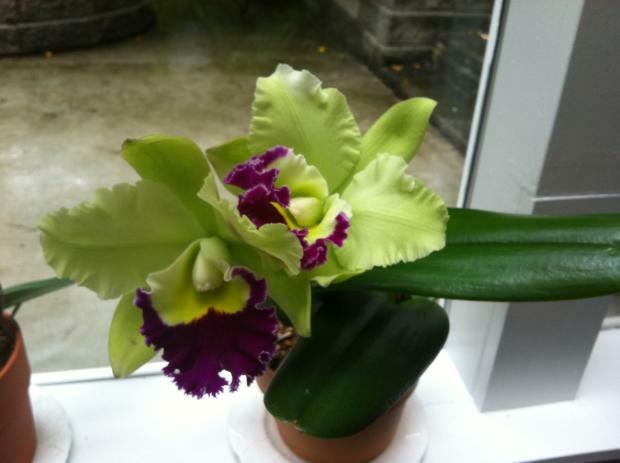 Another baby picture of my Brassolaeliocattleya Greenworth Oct. 11, 2011. There are certain times in life when its really worth being lucky. Picking just the right orchid, the one that will be happy in your presence, the one with which you form such a special bond it becomes your long-term friend, now that’s something. I remember when I first repotted it. So I repotted it and repotted it throughout the years. Should you want to know the techniques and materials I use for repotting, read this blog. 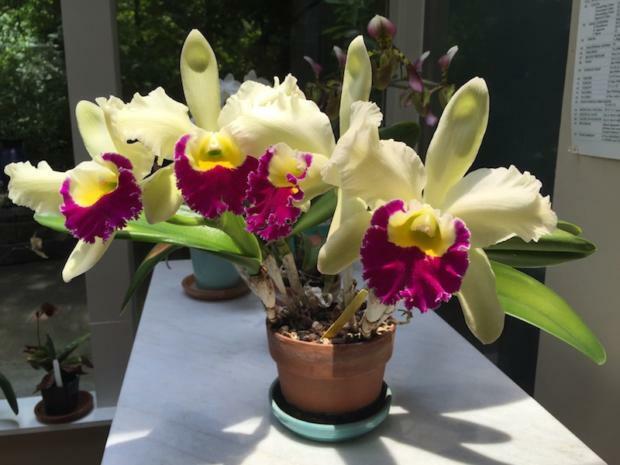 Or if you’re curious how I use natural healing with my orchids read this blog here. 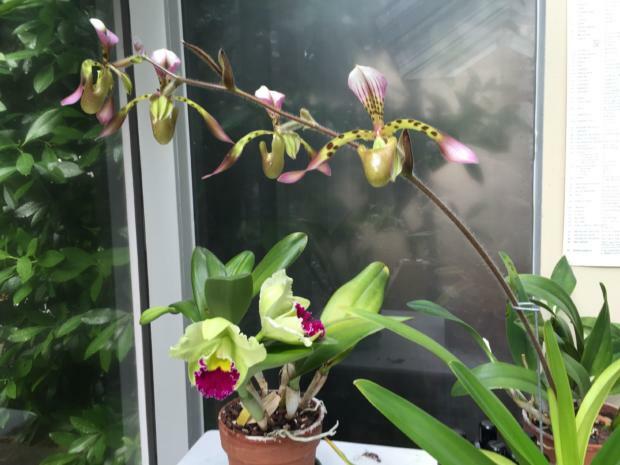 And then one of my long-term clients, her birthday was coming up, and she like me really loved the chartreuse orchid so I thought I might divide it to share the wealth with her. Alas, this repotting nearly broke my heart. The roots were so old and weak I thought I might have killed it. 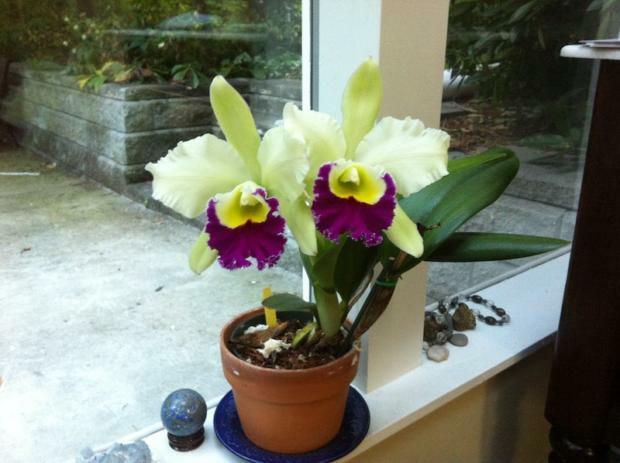 My chartreuse cattleya had nothing to share at that point. Thankfully, it survived my misplaced attempt at generosity. 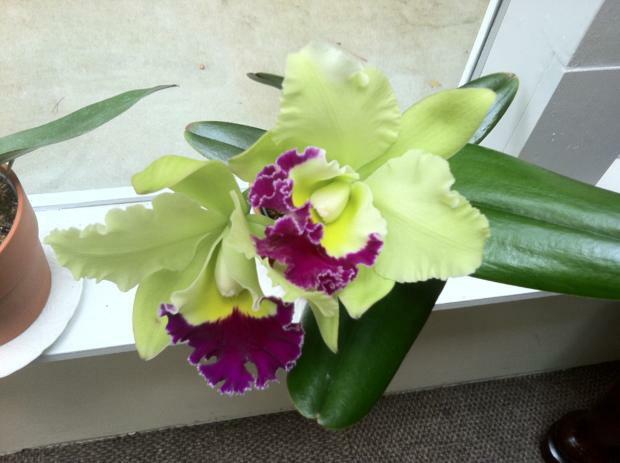 We are to be together forever until death do us part, this Brassolaeliocattleya Greenworth and I, no sharing. I got the message! After that poorly considered repotting, when it came time to repot again I resolved to get professional help. 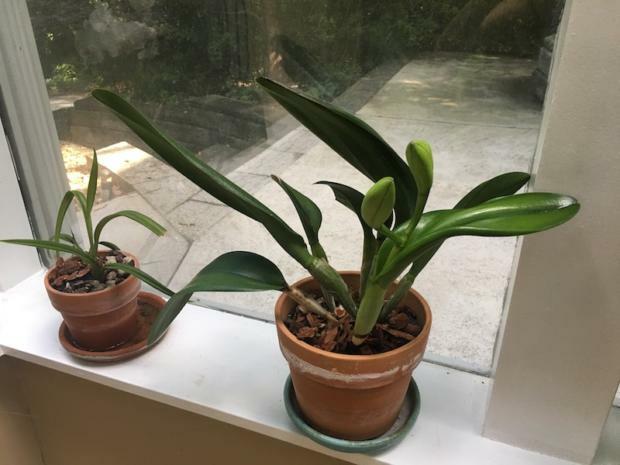 After my ill-fated repotting, my chartreuse cattleya was no longer thriving, June 29, 2017. I drove 45 minutes up to Rainbeau Orchids in Alpharetta, Georgia one Saturday afternoon in late July 2017. Upon arrival, no one appeared to be home. Surely this was a major mistake, I thought. How could a greenhouse full of stunning orchids not be flooded with customers on a sunny Saturday? I knocked at one door after the other. I even went to neighboring houses. No one there. Since I had driven that far I refused to give up. Finally as I knocked on the very last door in the greenhouse, a very sweet redheaded lady looked up from among the long rows of tables she had been tending. She repotted my Brassolaeliocattleya Greenworth for free, finally at last dividing it into two fresh clay pots, and only charged me $25 for another cattleya that called my name. 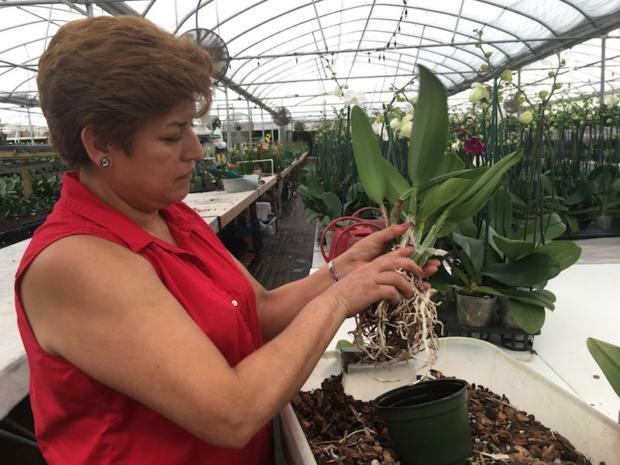 First professional repotting of my chartreuse cattleya at Rainbeau Orchids July 29, 2017. 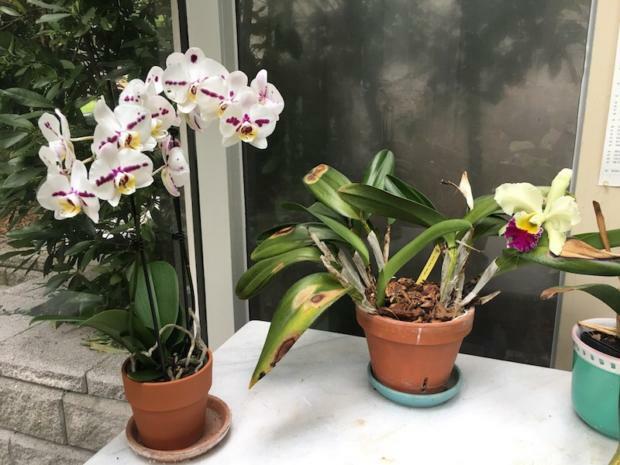 I was elated on the drive home that my best orchid friend had been so well cared for. And still I have waited 11 months for the two pots that had once been one Brassolaeliocattleya Greenworth to show new buds. My Brassolaeliocattleya Greenworth with my Paphiopedilum Haynaldianum. 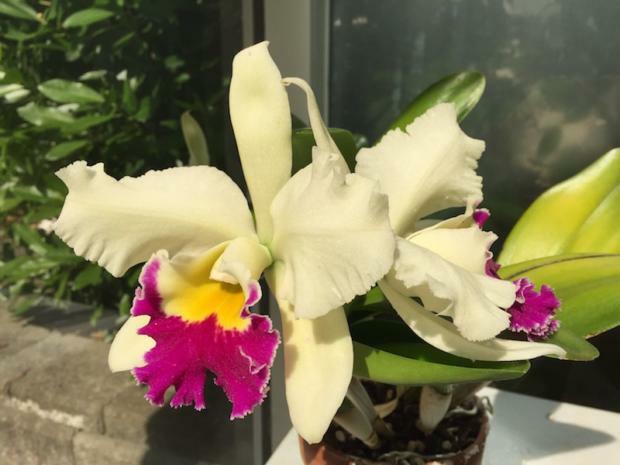 Through the years I have obsessively photographed my Brassolaeliocattleya Greenworth both alone and with its other orchid friends that populate my healing studio. Seven years later and I am still madly in love! Every morning now I go down to look and see what has happened over night. My ecstasy, my expectation, my thrill has already begun!